show business than in hunting and scouting. For 30 years Buffalo Bill's Wild West show toured the United States and Europe, playing at exhibition grounds to enormous crowds. Attending the Wild West show often seemed like an initiation into living popular Western history. The scenes and narratives enacted on stage were dramatic re-enactments of famous incidents such as the “Attack on the Deadwood Stage Coach,” “Attack on a settler's Cabin,” “Great Hold-Up,” “Bandit Hunters of the Union Pacific,” “Attack on an Emigrant Train,” and so forth. The Wild West show featured a multicultural company that included riders from five continents and strangely diverse ethnic groups like, everything from American Indians, cowboys and cowgirls, Mexican vaqueros, Boers, gauchos, Japanese "samurai" and Cossacks. William F. Cody a.k.a. 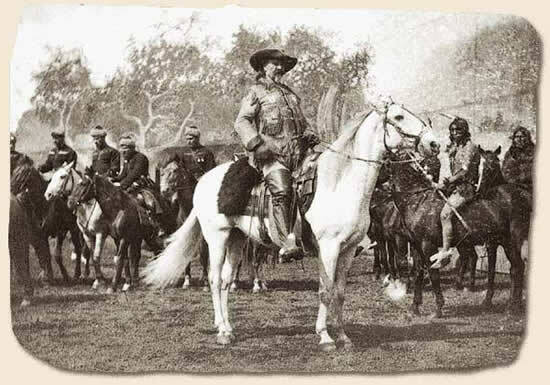 Buffalo Bill (1846-1917) was a frontiersman, hunter, scout, showman and entrepreneur. In 1867 Cody began hunting buffalo (reportedly he shot 4, 280 of them) for Kansas Pacific work crews, thereby earning his nickname and reputation as an expert shot. In 1872, he became one of only four civilian scouts to be awarded the Congressional Medal of Honor during the Indian Wars for valor in action. When the show was launched in 1883 it was an immediate success. According to The Illinois State Journal, the show was, “of the very highest importance to children because by the time they are adults the whole thing will have gone to the forgotten past.” The capturing of this vanishing frontier world and cultures was deemed one of Cody's most important legacies. By 1885, the show's annual income had reached $100 000.